From left, Devon Strover, Byron Rainer and Curtis Borges learn how to put out a smoldering tree. They were working as a combined crew of veterans and Southwest Conservation Corps members learning how to fight wildfires. The program was offered in May near Beaver Meadows Road northeast of Bayfield, about a week before the 416 Fire started. 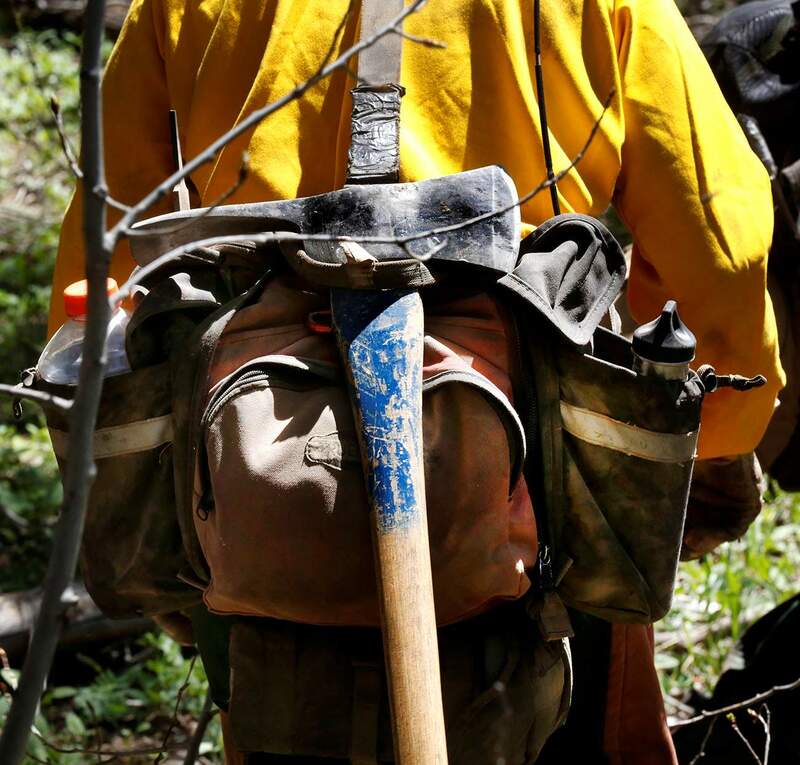 High in the San Juan Mountains, one week before the start of the 416 Fire, a small crew of trainees cleared brush and cut fire lines, preparing for the real thing. 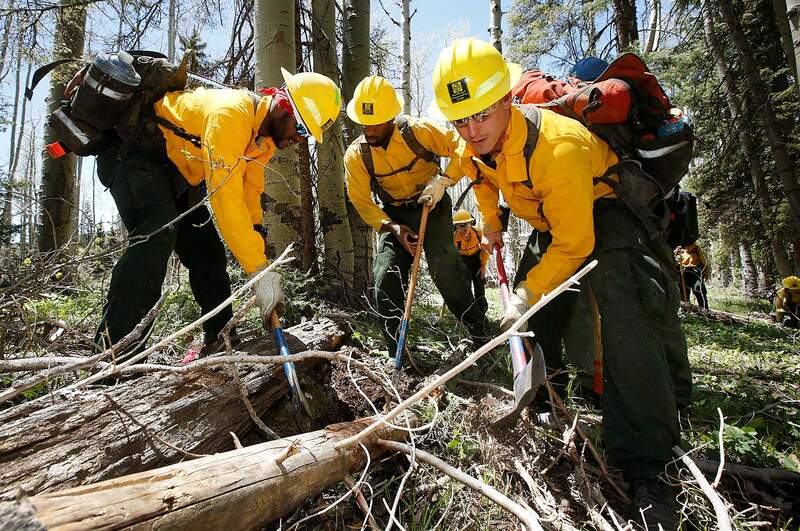 It was the first time in Southwest Colorado that the U.S. Forest Service hosted a weeklong firefighter training course for a crew of combined veterans and Southwest Conservation Corps members. The result is twofold: The training provides job opportunities for locals, especially for ex-military personnel, while at the same time responding to the need for firefighters to staff fire seasons that have stretched longer during the past two years. “And this allows us to have a local, well-trained militia in case something happens nationally and firefighters stationed here get pulled,” said Bevin Protas, a squad leader for the Forest Service’s Columbine District. 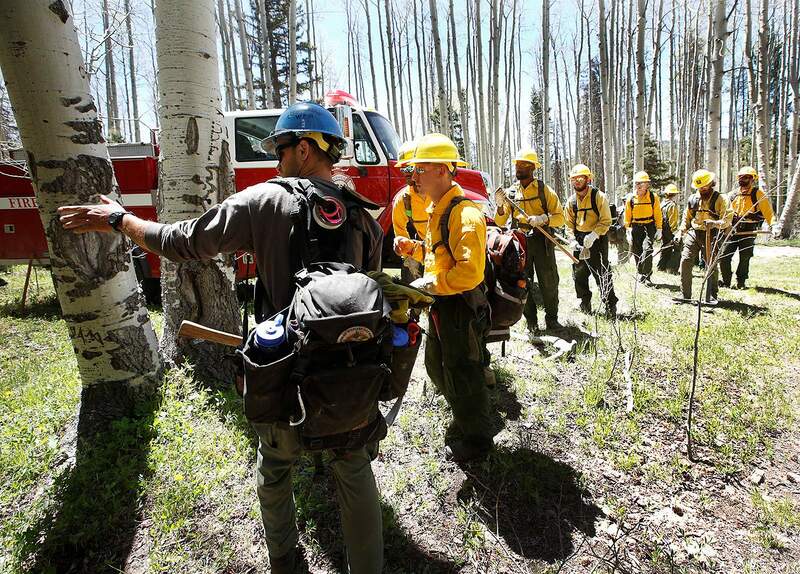 The U.S. Forest Service hosted a weeklong firefighter training course for a crew of combined veterans and Southwest Conservation Corps members in late May near Beaver Meadows Road, northeast of Bayfield. The program teaches job skills and fills a need for more firefighters. It was not known Thursday whether any of the trainees were put to work on the 416 or Burro fires. The five-day firefighting training course begins in a classroom that is actually a wall tent set up about an hour north of Bayfield in an area known as Beaver Meadows at an elevation of about 10,000 feet. There, trainees learn the basics of wildland fire operations, such as ignition, control, mop-up and suppression, among other tasks. 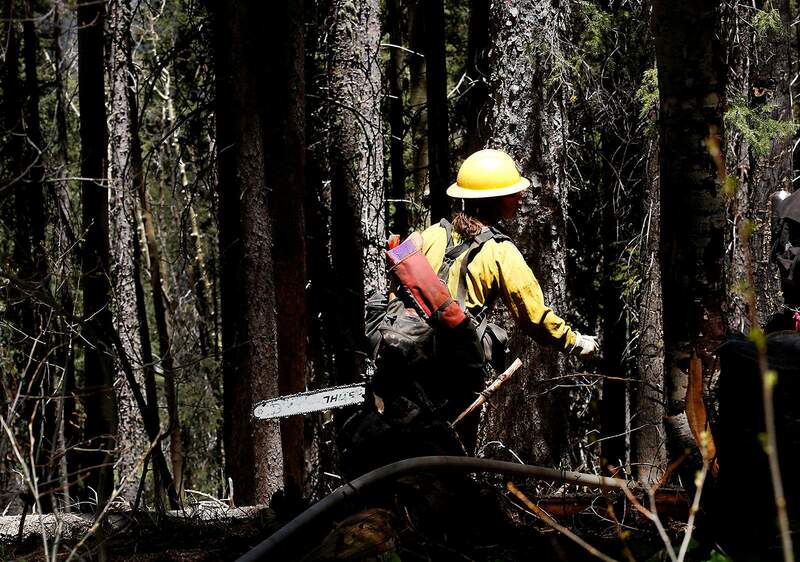 About midweek, crews begin the actual hands-on field work, spending long days in mock fire drills by digging fire breaks, cutting saw lines and laying fire hose to get water from the trucks to the mock fire. Zac Petty, right, with the U.S. Forest Service, instructs Kristen Hencke and Thomas Stephens, both members of the Southwest Conservation Corps, on how to cut a tree during firefighter training last month near Beaver Meadows Road northeast of Bayfield. By the time trainees are done, they will have learned and received a certificate for Firefighter Type 2 – the minimum requirements that allow a person to be hired on an entry-level firefighting crew. Protas said this training gives the crew a leg up compared with others. She said it is competitive to get on a firefighting crew at the entry level. But if trainees are hired through this course locally, and do a good job, they then become in high demand. “With good references, you have a good shot getting a job anywhere in the country,” Protas said. And firefighting jobs pay well. Though it can vary greatly, salaries range anywhere from $25,000 to $30,000 for employment through fire season, which typically lasts six months. Kristen Hencke with Southwest Conservation Corps learns how to select trees and brush to cut as part of a firefighter training program offered last month near Beaver Meadows Road northeast of Bayfield. Chuck Svendgard said he served in the Marine Corps for six years, spending time in active duty in Iraq around 2007. But when he got out of the military, he, like so many others, had trouble transitioning to civilian life. Joining a firefighting crew has proved to help, Svendgard said. Veterans find a sense of camaraderie, similar to what they enjoyed in the military, and though not comparable to combat, the work is tough and similar enough to provide purpose. Being around other ex-military can help with the mental aspect of dealing with civilian life, he said. Tools of the trade used by firefighters-in-training last month near Beaver Meadows Road northeast of Bayfield. The other half of the 16-person training crew was comprised of adults ages 18 to about 25 with the Southwest Conservation Corps. Lance Vaelli, a crew leader, said he received a college degree in environmental science but wanted to be in the field. Vaelli said getting more people certified with Firefighting Type 2 training helps build a base of core crews that can help with local fires if larger fires elsewhere divert firefighting resources. “Now, we can call on our crew,” he said. 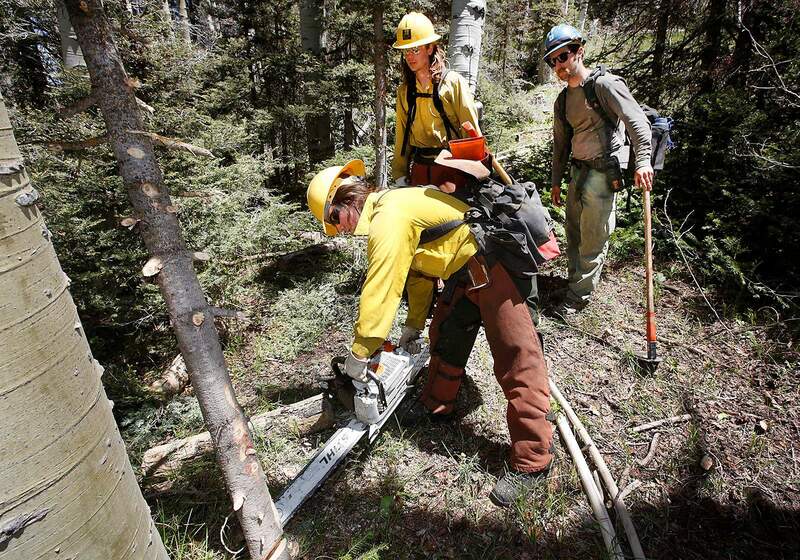 The Southwest Conservation Corps offers a sustainable forestry crew program that helps with fuels reduction, among other fire-related work. “This training has been a lot of hands-on, which we appreciate,” Vaelli said.